A watermark is a image or other content that is printed in the background of your report. You can use watermarks to indicate a status of your report (Confidential, Draft or For Internal Use Only). Or you can use watermarks to print a form template into the background of your report. A well defined watermark can transform a report from a uninspired bunch of numbers into a fully branded document that reinforces your companies image in all receivers of the report. 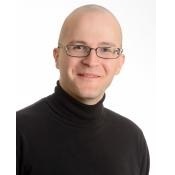 So how do you define a Watermark in Pentaho Reporting? When you create a new report, the watermark section is hidden. Before you can create new elements on this section, you will have to show it in the Pentaho Report Designer. Locate the Watermark node under the master report node. 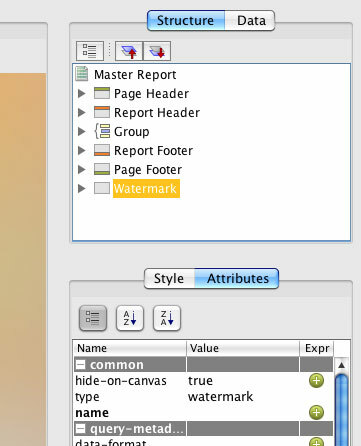 At the bottom of your design area in the report designer window, you will now see the watermark section below the page-footer section. The watermark section is printed behind all other content. Watermarks are special content that is only useful for printing and the PDF export. Plain-Text exports and all table-exports do not allow overlapping content. A watermark would prevent the printing of other content on that page. Therefore watermarks are disabled for these export types. Even if your watermark section contains content, the Pentaho Reporting Engine would not process any of it. A watermark always spans the complete width and height of a page and content printed on the watermark does not affect any other content on the page. Watermark section is a ordinary band. You can drag and drop fields, labels or images into the watermark just as you would do for any other of the bands. The watermark is printed when a new page is started and fields print the same values as fields defined in the page header. Like all page-header or -footer bands, watermarks cannot contain any subreports. The Pentaho Report Designer ships with the “Production Reports/Invoice” sample report that makes use of a watermark to show a background image to reinforce the branding of the “Steelwheels” toy company and prints a stamp text on the report. This entry was posted in Basic Topic, Report Designer & Engine, Tech-Tips on June 28, 2011 by Thomas.